P&P Trailer Sales is a premier nationwide trailer dealer located in Texas, Oklahoma and Arkansas. Our goal is to make trailer shopping a quick and easy process no matter where you are located. We accomplish this with our Best Price Guarantee, knowledgeable staff and quality trailers with the features you need. There is nothing hidden. We will make sure you know what features and options are most popular. Don’t be disappointed by options on the trailer you purchase, know before you buy. Our trailers are ordered and stocked with the user in mind. Our premier trailers are loaded with ducted A/C, upgraded axles, double air conditioners on larger living quarters and more. Bring our competitors price and listing to our experienced staff and we’ll be happy to review option by option with you to help you make the best decision. Read more below on our best price guarantee. We use our trailers; we know there are little things that make a big difference to make you and your horses comfortable going down the road. We do the legwork of shopping around so you don’t have to. 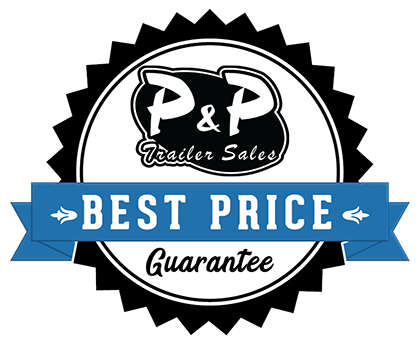 At P&P Trailer Sales we know you want to make sure your decision to shop with us is the best one. That is why we offer a Best Price Guarantee. No more hunting for the best price, spend time finding the right trailer for you. The Guarantee. P&P Trailer Sales guarantees to have the best price on any new unit that is of the exact make, model & options. Just provide us with a quote, in writing, prior to purchase and we will beat the price. It’s that easy. Available for in stock units only. Competitor’s quote must match the unit we have in stock. Competitor’s unit must be currently in stock (not on order) and new with no damage (i.e., hail damaged or clearance units). Cannot be combined with any other offer or sale. Trades and delivery are excluded on Best Price Guarantee. P&P Trailer Sales reserves the right to verify the information before approval. P&P Trailer Sales reserves the right to deny a quote at any time. Many of our employees from service to sales are using trailers in the industry every day. Along with over 25 years of experience, we can answer any question to help you with your decision. Give us a call to discuss what you use your trailer for and we can help find the one that suits you and your family. Once you are a part of the P&P Family we would love to stay in touch with you by participating in our P&P Patch and referral program.